“I’m a flamenco dancer now. And a poet. 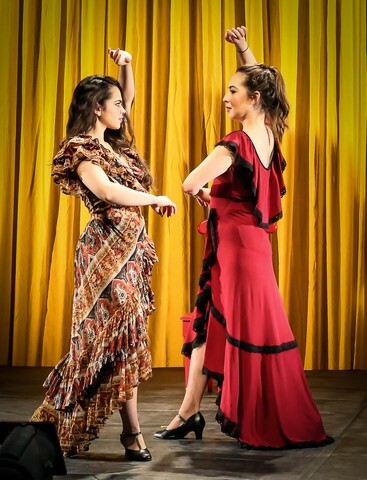 And an outcast, and a Latina; a political force,” exclaims Rosario, the fiery leader of a combative troupe of performers, in the musical, Rosario and The Gypsies. Set in 1982, at the outdoor San Diego nightclub where the group performs, the musical features a collection of colorful characters grappling with their free spirited 1960’s political idealism that clashes with the cold era of Ronald Reagan. Rosario met her amiable husband Howard while in the chorus of a rhumba show. Her disaffected intensity is driving them apart. Other group members include Claude, a French accented drag queen, Mary another feisty Latina, stalwart Gustavo, and Max, a band member. Intruding into all this personal turmoil is Joe, a young Right Wing Christian activist. The minimal plot involves the tangle of their increasingly strained relationships with each other. Composer Rick Vartorella’s music is a lively collection of smooth jazz, pop, rock and Salsa. It’s expertly played by John Dyer on bass, Scott Morehouse on percussion, Mr. Vartorella on guitar. Music director Robert Boston is on piano, and also skillfully plays Max, a band member in the show itself. Their excellent musicianship is the show’s chief virtue. The cast’s singing skills ranges from good to patchy. Premiering in 1982 as a one-act play with music, author Eduardo Machado, has now revised and expanded it into a full length musical. The first act is a decent all around effort, but the second act is leaden. Taking place 10 years after the first, it’s an interminable update of the character’s lives with numerous flamboyant plot twists. The Cuban-born Mr. Machado is a prolific and noted author for the theater and television. He has affectionately delineated each character with detailed authenticity. The dialogue is rich in heightened simplicity that borders on earnest stiltedness. The lyrics he has written with Mr. Vartorella are serviceable. These elements do endow the characters with a passionate straightforwardness. Machado also directed the show and the staging is purposeful. Apart from the accomplished flamenco sequences, Crystal Field’s choreography is of the herky-jerky mode. Michael Bevins’ costume design is a great attribute of the show. He has created a variety of vibrantly realistic looks for everyone as well as the garish fantasy guise of a fierce Uncle Sam figure that pops up from time to time. Running with the description that the nightclub is adorned with Christmas lights, lighting designer Alexander Bartenieff has decked out the theater with an array of various types of such lights. Combined with his resourcefulness in general, these effects greatly enhance the playing space. Consisting of a spare, raised square wooden platform with red chairs and red boxes, the set design by Mark Marcante is of inspired basicness. Heather Velazquez as Rosario gives a wonderful portrayal of this tempestuous and good-hearted woman. Her dramatic and dancing talents are up to this challenging role. Gizel Jimenez makes a great impression as the volatile Mary. Michael Domitrovich as Claude, the drag performer, has a charmingly sweet and low-key quality that also serves him well in a surprise different part in the second act. Personable John J. Concado as Gustavo brings warmth and depth and is a fine foil for Rosario. Handsomely gawky Kirk McGee is pleasantly comic as the conservative interloper Joe, and suitably creepy as the parody Uncle Sam. Quinlan Corbett ably captures the rage and conflict as the dejected husband of Rosario, Howard. Corbin Went is very effective in his brief role near the end as an offbeat romantic addition to the events. At its core, Rosario and The Gypsies is a well-intentioned theatrical tapestry of idealistic lost souls, but in this deficient incarnation it doesn’t succeed in its aspirations. Beautifully subtle and sensitive revival of the play about the unexpected love affair between British theologian and writer C. S. Lewis and American Joy Abramson. The East Village theater fixture gloriously comes back to the stage after an illness in her sly surrealistic topical play accompanied by a sparkling cast.